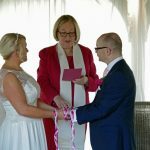 Renewing your wedding vows - why and how! 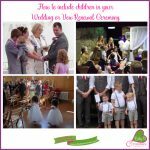 Renewing your wedding vows – why and how! Vow Renewal Ceremonies are very special and they really are unique, personal and meaningful for each couple. Recently someone asked me why people renew their vows. They added – I made my vows 20 years ago and nothing’s changed so I don’t see the point! If that’s how you feel you can stop reading now. There’s nothing to see here for you. 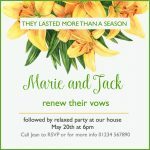 But if you have ever thought about renewing your wedding vows then stick with me as we think about the why and how of Vow Renewal. Our original wedding wasn’t as we wanted it to be. one of you wasn’t well and you couldn’t focus on the day. Our wedding day was so fabulous we want to experience it all over again. 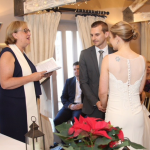 Recently I conducted a ceremony for a couple to renew their vows who had said on their wedding day – This was fabulous – let’s do it again in ten years time. So they did! Back at the same venue, with many of the same people involved. We have been married for some time and want to celebrate a milestone moment. This is a popular reason to want to celebrate with family and friends as well as renewing your vows for the years to come. Wedding anniversaries such as 5, 10, 20, 25, 40 and 50 years give an excellent framework for a vow renewal ceremony and celebration. We have overcome some obstacles and want to celebrate our ongoing love. Obstacles can include sickness, family difficulties or marital breakdown. When a couple decide that actually they still want to go forward in life together This can be a compelling reason to celebrate. And of course the why might be any combination of these or something else entirely. There are so many ways you can choose to renew your wedding vows. You should make the celebration exactly as you want it. Some couples have a ceremony and celebration which is even bigger than their original wedding. The couple don’t see each other on the day until one or both are walked down the aisle, they have best men and/or bridesmaids, a certificate signed by the couple and some witnesses, a large guest list, a sit down meal in the afternoon and then more guests and food with music and dancing in the evening. 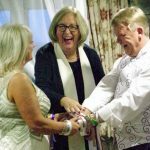 Their ceremony includes new or rededicated rings, readings, music, singing and meaningful rituals such as a sand ceremony or handfasting. Many have a simple ceremony followed by a party that reflects who they are now. 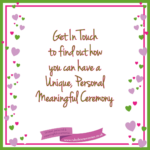 Although the ceremony may still include elements such as readings and Handfasting. It may also involve their children or grandchildren, their parents or siblings or friends and even their dogs – anyone who is special to them. For some couples their guests are mainly friends, whereas others mainly invite family members. A couple might hold the gathering in a stately home, a local pub or restaurant or golf club, some place that is special to them, or even in their own home and garden. Anything is possible. Often guests gather informally and share drinks before being seated formally or informally for the ceremony. The couple will have set the vibe for the day and the Celebrant will try to ensure that is captured. And of course you don’t need to have any guests at all. I was once invited to help a couple renew their vows in an intimate ceremony just for the two of them in their favourite forest glade. After the ceremony they went on to share a picnic together. You may want to include elements from your original wedding such as music, decor or the actual vows. Or you may want to do things completely different. Often you would have been limited about what your vows could include on your wedding day. You may want to repeat them, tweak them or write totally new vows which reflect your relationship now. Because there are no legal requirements for a Vow Renewal Ceremony you can have whatever content you want. You can also hold it wherever you want and invite whoever you want.. 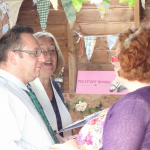 So if you are considering renewing your wedding vows do get in touch. We can ensure you have a unique, personal and meaningful day. If you have the why, we can help you work out the how.